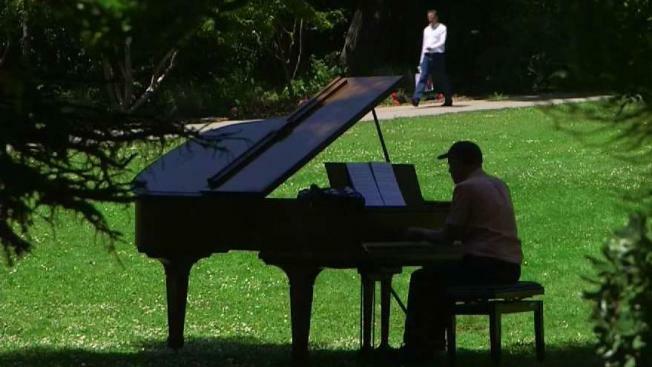 The bougainvilleas and hydrangeas of San Francisco’s Botanical Gardens are getting serenaded to the tune of Bach and Hayden as the Flower Piano event begins its fourth year — a dozen or so pianos scattered throughout the gardens as players of all skill-levels seem to emerge from the bushes to play them. Joe Rosato Jr. reports. The bougainvilleas and hydrangeas of San Francisco’s Botanical Gardens are getting serenaded to the tune of Bach and Hayden as the Flower Piano event begins its fourth year — a dozen or so pianos scattered throughout the gardens as players of all skill-levels seem to emerge from the bushes to play them. “It’s really becoming a venue where pretty much anything that can be played on a piano that’s a form of music can be played here,” said Dean Mermell of Sunset Piano, which organizes Flower Piano. The 12-day event culminates with two weekends of concerts by a range of artists from Cuban artist Chuchito Valdés to Bay Area pianist and composer Allison Lovejoy. But the event’s charm may draw its deepest breath from the surprising mix of the regular piano-playing public who slip onto the benches at any time and bang out everything from Chopin to Tom Waits. Pianist Neil Stadtmore plays classical music on a grand piano in the Botanical Gardens in San Francisco as part of the 12- day Flower Piano event. A stroll through the garden’s verdant abundance will divine the tinkling of ivories from every direction — from young children(and some adults) pounding an old upright with abandon, to the sounds of a Scott Joplin classic played on a grand piano tucked beneath a tree. “This is the most fun I’ve ever had and I’ve played quite a few places,” said eighty-eight year old Bob Hearn who coaxed a ragtime gem out of a grand piano. As he slid off the bench, Neil Stadtmore immediately took over, setting a stack of sheet music down and launching into a classical song. The mix of music and nature seem natural bedfellows the in the serene setting, surrounded by the chaos of city life. For some, the annual event has sewn the seeds of musicality as it did for elementary school student Aiden Gettys who plunked out a convincing version of Clair de Lune to the applause of a small audience. A pianist plays a grand piano beneath a tree in the Botanical Gardens during the 12-day Flower Piano event. The sounds of jazz, classical and… well anything else… have a sort-of pied piper effect, drawing visitors to explore the terrain and playing of whoever decides to take the keys. LeBlanc and a friend followed the sounds of pianos around the gardens, settling in as a young boy played a modern piece as his grandmother took video of him.